Ever get that awful feeling in your stomach when your Christmas tree has to be thrown on the curb after bringing you and your family lots of pine scented days? With a little more work you can plant that tree instead. I always feel a little bummed out after the holidays and I am telling you, it has nothing to do with the presents I didn't get. It is the throwing away of the tree, and seeing all of its pine needled cousins littering the roads for weeks after Christmas is over. I don't know about you, but spending $100 bucks on something that I throw out in two weeks just seems like a bad investment. 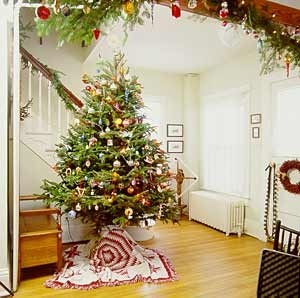 This year I am ordering a living Christmas tree so that we can plant it in our back yard after Christmas is over. I October/ November you can go to your local nursery to order your living Christmas tree. Any local nursery should be able to do this for you, or at least point you in the right direction. Once ordered, start concocting your plan. Pick a spot in your yard where you will watch your Christmas tree grow year after year and dig up the soil in this spot before the ground freezes. Put the soil into plastic bags to be stored in a garage or in an area where it will be relatively protected. Please place something over the hole in the ground like plywood so as not to trap some unsuspecting animal or child in your Christmas Tree hole- that would be bad. Once you get your Christmas Tree pick a spot in your house that is away from any type of heater and always keep that bulb watered in a very sturdy container. After about 3 or 4 days inside, your tree is ready to go out. You can place it on a porch or balcony until you are ready to plant it, and try to keep it outdoors for a few days so it does not go into shock from the cold temperatures. Ready to plant? Water the hole very well, and put some of your pre-dug dirt into the hole. Loosen the burlap away from the trunk and plant. Cover with the rest of the soil, mulch it and water every few days until the ground is yet again frozen. If you can't deal with all of this I do not judge you. It's a big job so have someone else do it for you! You can also rent a Christmas tree at The Living Christmas Company.